9 years of preparing songs for teaching at Christmas later, and I have created this refined ebook for guitar and ukulele. It includes sheet music with TAB for both melody and chords parts. I have arranged the sheet music myself, so I could aim the ebook at beginners, but I have not changed melodies or structures. I have presented the sheet music in the most simplistic way whilst also aiming to provide a challenge to players that have been learning for a while. Contains Sheet Music for both guitar and ukulele, and Lyrics Sheets, which can all be printed an unlimited amount of times by the purchaser. Ideal for guitar teachers and ukulele teachers. The download contains 4 seperate ebooks. One with them all in, and then 3 seperate ebooks for easy printing of guitar, ukulele and lyrics. 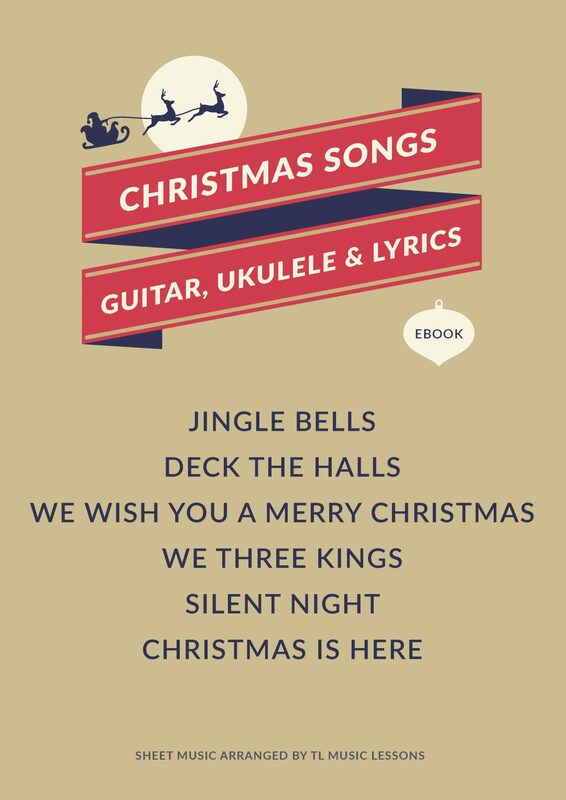 There are both chords and melodies (including ukulele and guitar TAB) for the 5 public domain Christmas songs. There are also guitar and ukulele chords for the original Christmas song called ‘Christmas Is Here’.